Staff old and current, at AMH New Horizons in Newry and Mourne celebrate 25 years of the vital community service. Clients and staff from Action Mental Health (AMH) New Horizons were celebrating recently with a BBQ in the Serenity Garden at their base in Enniskillen. AMH New Horizons Fermanagh was established in 1991 and was initially based in Enniskillen town centre. In 1992 the service relocated to its current site in Cherrymount Road, Drumcoo, Enniskillen. 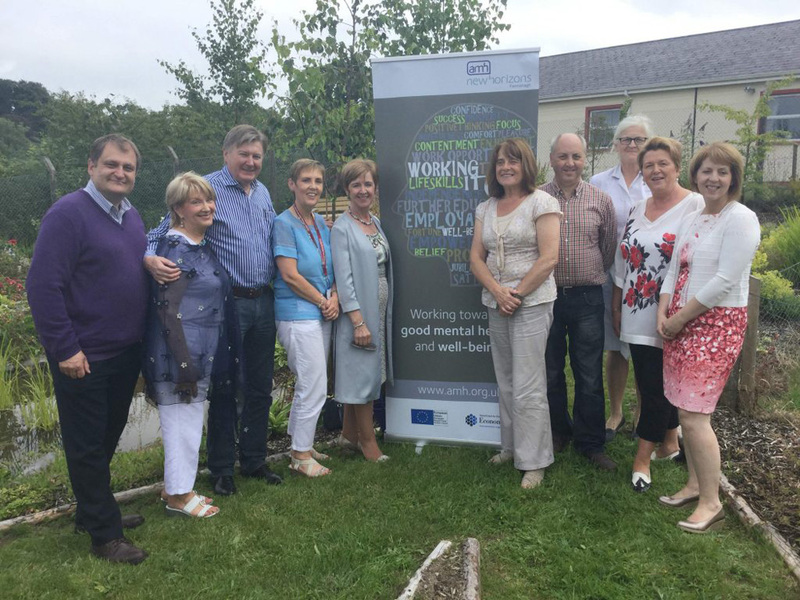 AMH New Horizons Fermanagh works in the community to improve the health and well-being of people, changing the lives of those living with mental ill-health and promoting resilience and well-being. Action Mental Health has grown to be the largest mental health charity in Northern Ireland. The project is part funded through the Northern Ireland European Social Fund Programme 2014-2020 and the Department for the Economy, and the Western Health and Social Care Trust. The development of the Serenity Garden was taken forward by the Time Out Programme funded by the Big Lottery through the Western Regional Alcohol Programme. Caroline Ferguson, Service Manager, has been with AMH New Horizons Fermanagh since it first opened its doors. Reflecting on the past 25 years Caroline said: “It’s wonderful to reflect back on the past 25 years and to see how the service has grown and developed. We opened our doors here in 1991 with 12 clients and today we have more than 150 people availing of our services though AMH New Horizons and the Men’s Shed. If you are interested in finding out more about New Horizons Fermanagh go to www.amh.org.uk/services/new-horizons or call 028 6632 3630.